In a Pew Research Center survey in March, only 16% of Americans rated the nation’s economic condition as “excellent” or “good.” Ordinarily that would be nothing to write home about, except that it was the highest positive rating in five years. Those numbers began to deteriorate sharply starting in late 2007 as the nation’s economic crisis took hold. 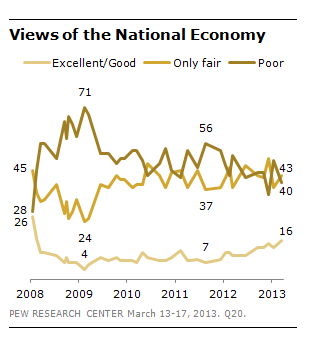 In February 2008, only 17% of people rated the economy excellent or good and, a year later, only 4% gave the “good” response, ( no one used excellent). In that month’s survey, 71% called the economy poor.